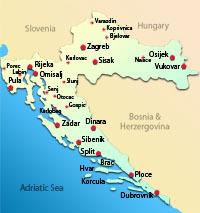 Croatia entered the European Union in 2013. Split is a city in the Southern part of the country , close to the Adriatic sea. The city was a colony of Ancient Greeks and later became a part of the Roman Empire. One of the greatest monuments is the Palace of the Emperor Diocletian. One of the Faculties is the Medical Faculty. In 2011 an English speaking program in General Medicine started . The Medical School receives many applications. The selection of the candidates is based on the file of the applicant and the University reserves the right to examine the applicants for entrance into the Medical Faculty.